A Dubai ‘United Arab Emirates’ based publication from November 2013. 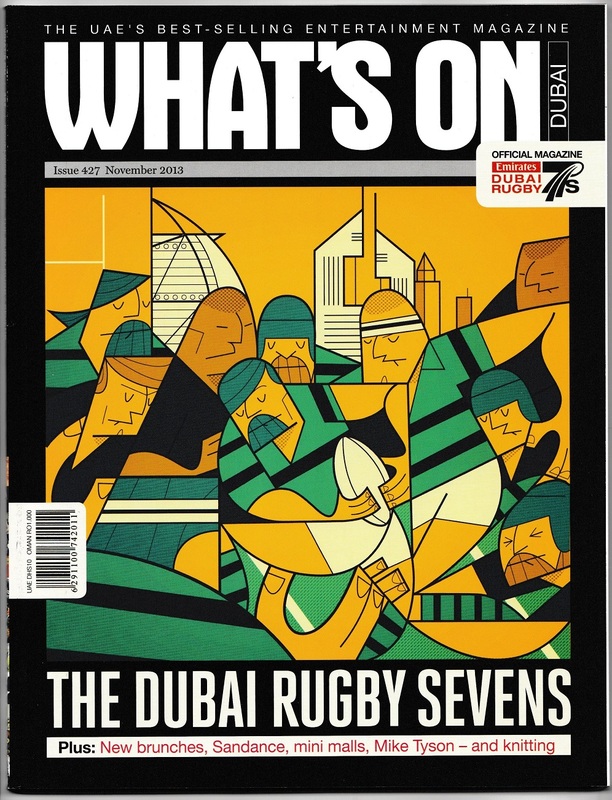 The illustration on the cover of this magazine was produced by Italian Artist ‘Ale Giorgini’ who explained his work with the following statement “I always try to connect all the elements within a design, so here I’ve melted the lines and shapes of the Rugby players into the city skyline. I like to watch rugby – but I am not in the right shape to play it”. The 2013 Dubai Sevens competition was the second event of the ‘Sevens World Series’ of the 2013-14 season (hosted by ‘The Sevens’ a purpose built Rugby stadium located just outside Dubai. It has 8 Rugby pitches at the facility and the main pitch can hold upto 44,000 spectators). The eventual winners of the Cup competition were Fiji who won their first competition in the UAE ‘after 14 years of trying’ beating South Africa in the Final 29-17, after earlier in the day beating New Zealand by a record score of 44-0.